BTL-11 TurnTable - Freewheel turner. BTL-12S LockOut - Lockring remover. BTL-13 Hexagon 8 mm - Hex key. Hex Key. BTL-15 Turner II - Spoke wrench. - Hex key set (4,5,6 mm). Torx key set (T25, T30, T40). 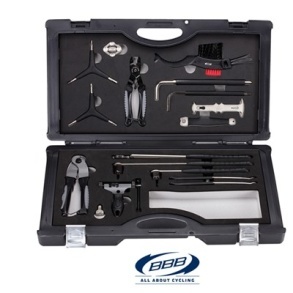 BTL-33L BottomFix - Lock-ring remover / bottombracket tool. BTL-51 ChainChecker - Chain wear checker. BTL-54 ProfiCut - Cable cutter. BTL-55 ProfiConnect - Chain rivet tool. BTL-77 LinkFix - Chain link tool. 2 x BTL-79 ProfiLift - Tire lever.